In summer it is easy to spot slender aerodynamic terns diving head first into the East River to catch small fish. Common terns, Sterna hirundo, and Forster's terns, Sterna forsteri, are both likely sightings. This Forster's tern is resting on the Brooklyn shore of the East River between dives. Click to enlarge. This is a common tern. 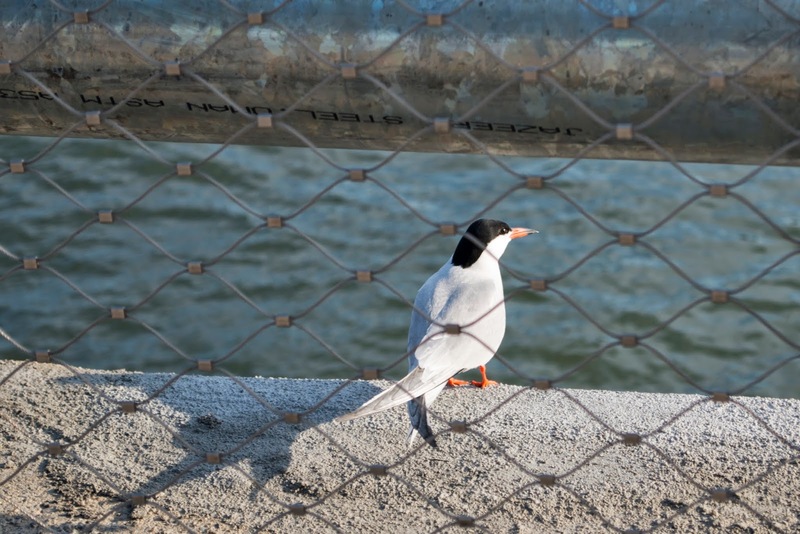 The differences between common and Forster's terns are subtle and confuse many birdwatchers. Common terns have darker backs, bills more red than orange, and a less extensive black area at the tip of the bill. The feathers of the folded wings are noticeably darker. A German taxidermist walks into a sausage store, places his order, but then notices he has forgotten his wallet. All he has with him is a stuffed bird, which he offers in payment. The storekeeper agrees to take a tern for the wurst. Why do terns fly in flocks? Because one good tern deserves another! A flock of terns flew over a marijuana club in Denver. No tern was left unstoned!